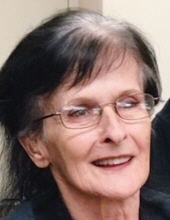 Birch, Nancy Kay - 71, of Mt. Morris, died April 10, 2019. Visitation will be held 1-5 PM Wednesday April 17 at Sharp Funeral Home & Cremation Center 6063 Fenton Rd. Flint. Nancy was born August 2, 1947 in Flint the daughter of Mervin and Dorothy (Vernon) Meyerhofer. She married James Birch who preceded her in death in January 30, 2019. Nancy was a graduate of Atherton High School. She was a homemaker. Nancy enjoyed fishing, camping and the outdoors. She is survived by her daughters: Shelly Snyder and Lisa Denike; step-son: Jimmy (Jamie) Birch; several grandchildren; siblings Jerry (Linda) Meyerhofer, Deborah (Rich) Figula, Tracy (David) Johnson, Ricky Hunsinger; several nieces and nephews. Nancy is preceded in death by her husband James; and son, Kelly Denike. Tributes may be shared at www.sharpfuneralhomes.com. To send flowers or a remembrance gift to the family of Nancy Kay Birch, please visit our Tribute Store. "Email Address" would like to share the life celebration of Nancy Kay Birch. Click on the "link" to go to share a favorite memory or leave a condolence message for the family.